I wasn't fortunate enough to be able to buy one of Junichi Yananose Tornado Burr's when it was offered by either Eric Fuller however I am lucky enough to have a puzzle friend who was kind enough to let me borrow his copy to have a play. 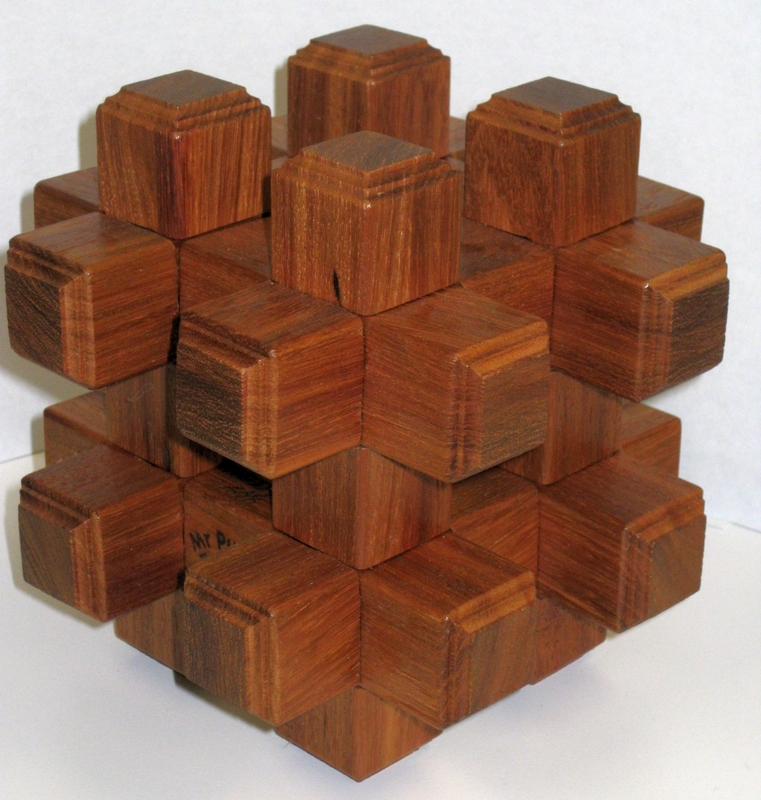 When Brian Young made copies of this puzzle, there were only 30 copies made way back in December 2008. And when you see how it's made you'll understand why. Each piece is made from a single stick, and while it may not be apparent at first look why that's such an issue, I think it will become apparent as you read on. The first thing that hits you about this puzzle is the scale. At 6" x 6" x 6" this is a very large burr. Brian has taken a great deal of care when finishing the ends of the burr pieces, and each is beautifully detailed, with a fit and finish that you'd expect from a master craftsman such as himself. The fact that this was part of his Craftsman line is really no surprise. The only other person I know of to have attempted this puzzle is Eric Fuller, and having seen his copy, while much smaller, it's every bit as well made! With a modest 12 pieces in the puzzle, while it would normally be considered a significant challenge, the Tornado is a challenge in an entirely different way. 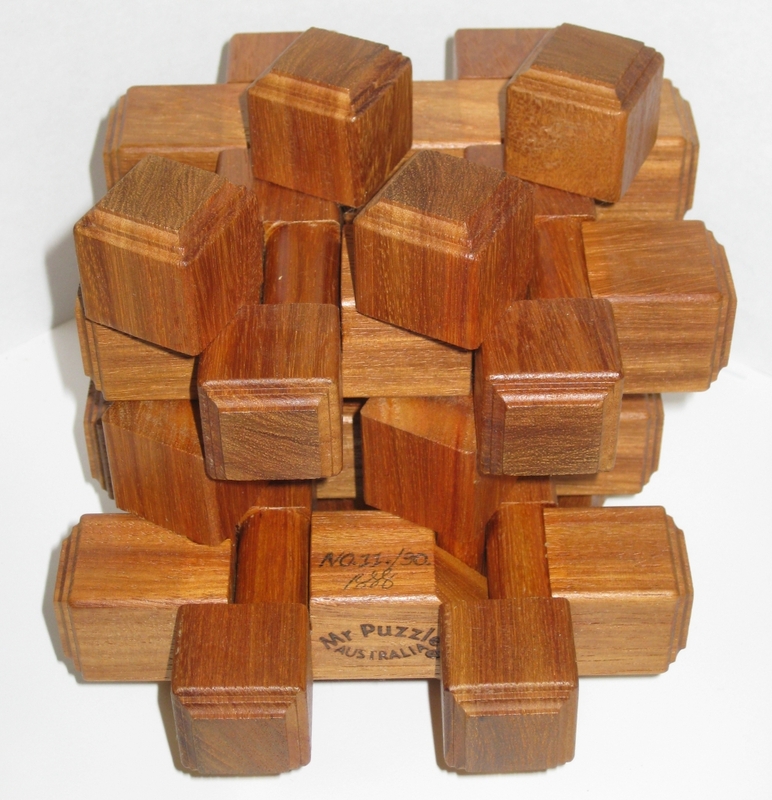 This is no conventional burr puzzle. 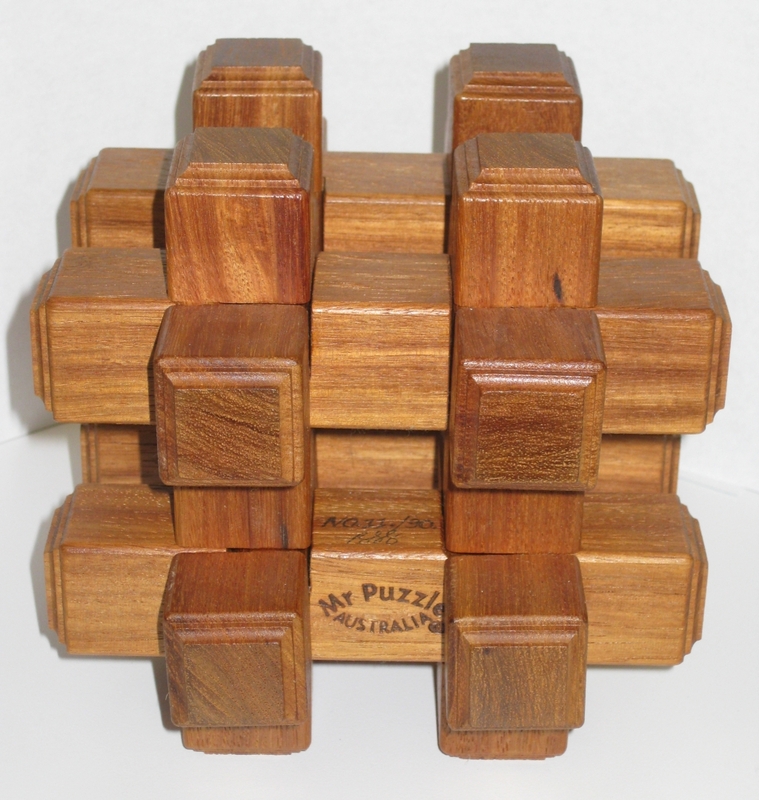 As I soon found out, no amount of pushing, pulling or tugging on any of the pieces will help you to find the 'first move' that you normally need to get a burr puzzle started. So with that done, what's left? I don't recommend blowing on it, or spinning it as you'll quickly end up dizzy and out of breath. The clue to the puzzle is in the name. "This ingenious burr was designed by Junichi in May 2007 with "head and hands; no computer". Junichi had the idea for a multiple rotational movement but did not get to finally apply it to a puzzle until he came up with the Tornado Burr. People often ask puzzle designers "What was going on in your head to design this puzzle?" What was going on in Junichi's head when he designed the Tornado Burr? Visualising things going up and down and back and forth at the same time is one thing, but things going up and down, back and forth and around as well is quite another! Junichi says the Tornado Burr "has very eccentric movements" and challenges puzzlers to "Try your luck, and stop this fierce tornado." Eccentric movements indeed! As you can see above, this puzzle has rotations, although not like any you'd have thought about before playing with this puzzle. How Junichi came up with this is beyond me. It's an insane puzzle mechanism, that simply imagining the interactions and movements entirely in your head takes a special type of mind. Coming back to my comments about the pieces all being solid and the significance of that fact becomes apparent. For the puzzle to work, it needs dowels rather than notches in the pieces. Each of these rods was hand turned on the lathe and has to be very accurately made. Not only that but it is turned on an off centre axis, making things just a little bit scarier! Having done a lot of work on the lathe recently myself, I can truly appreciate the work that goes into making each and every one of these pieces. At IPP27 in Australia, this puzzle received an Honourable mention. Having had the opportunity to play with one, I can see why. Despite not being a burr fan, I'd not hesitate to add one of these to my collection if it became available. The chances of that happening though may be fairly slim. What an interesting twist (no pun intended) to the burr. Incredible. Now I know why so many people are clamouring for this puzzle.